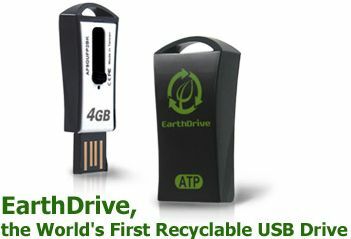 Over the past couple of years I've had dozens of flash drives in my hand, with varying sizes, shapes and colors but the EarthDrive from ATP is the first USB drive that claims to be eco-friendly. The housing of the ATP EarthDrive is built using the maximum amount of biodegradable materials, it features plastic made from corn, and ATP promises an unspecified portion of all profit generated from EarthDrive sales will go towards American Forests, an organization which plants trees through the United States as well as on a global basis. 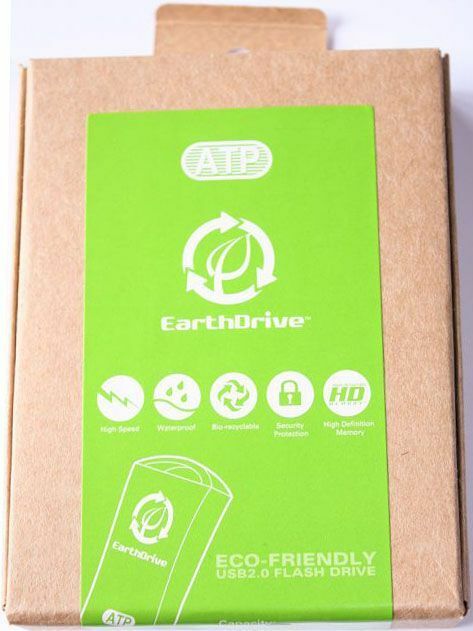 The ATP EarthDrive is available in capacities of 1GB, 2GB, 4GB and 8GB. Outside North-America the USB drive ships in a recyclable paper package, which is not only more eco-friendly than a plastic clamshell package but also a lot easier to open. Inside the box is the tiny EarthDrive USB stick and a small clip to attach the drive to your keychain. One side of the EarthDrive is black and features a green logo, while the other side of the drive is white. 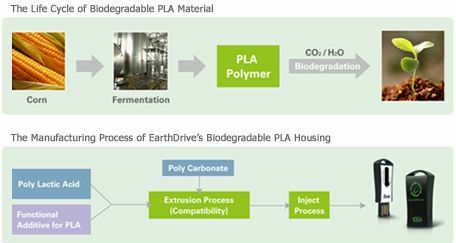 The housing of the EarthDrive was made using polylactic acid (PLA) polymer, this type of plastic is made from renewable resources such as corn and is biodegradable, it looks, feels and handles just the same way as petroleum-based plastic. While I admire ATP's goal to create a more eco-friendly flash drive, it's debatable whether the current generation of bioplastics are really that much better for the environment than plastics made from fossil fuels. As you can see in the pictures, the drive I received has a capacity of 4GB. The USB connector slides out but it's not a full-size USB connector so you need to make sure you stick it into a USB port the right way, so the four metal contact points of the USB drive make contact with the connectors inside the USB port. This side of the drive also has a tiny blue LED light indicator by the way. 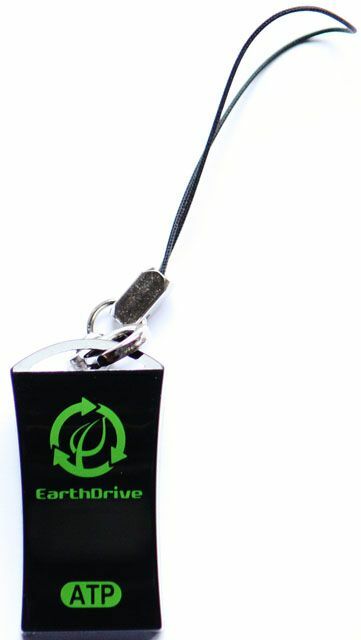 The EarthDrive is a pretty little USB stick - it measures just 35.7mm x 23.3mm x 10.31mm (L x W x D). The drive comes preloaded with disk partition, backup/synchronization and security software, the latter one enables you to protect the drive with a password. The backup and synchronization software is called Carry it Easy, this utility synchronizes documents, files, e-mails and browser favorites but unfortunately it's just a 30-day trial. 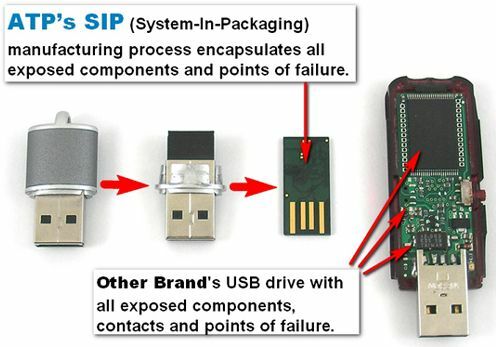 Another special feature of the drive is that it uses ATP's SIP (System-In-Packaging) which encapsulates all exposed components and points of failure. This manufacturing process makes the EarthDrive waterproof, shock proof, and dust proof.